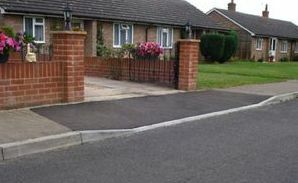 A tarmacadam or gravel surface abutting a boundary wall can rely on the wall to support the edge but where it is adjacent to a soft landscape such as a lawn or border, a hard edging is required to prevent it from breaking up on the edges in the case of tarmacadam or spilling over in the case of gravel. Edging products range from basic but functional kerbs or concrete edging to more ornate designs such as rope shaped concrete edging which can be installed in a complementary colour to the rest of the surface. Where the garden is higher than the driveway or patio a raised kerb edge restraint is required to prevent soil spilling over onto the new surface. 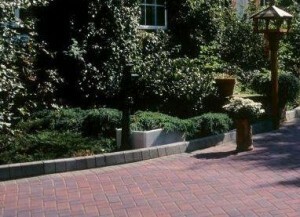 Most manufacturers of block paving and concrete paving have their own versions of these blocks. They are known colloquially in the trade as K.L.’s (quite simply ‘kerb large’) and there are smaller versions known as – yes – S.L.’s (‘kerb small’). Internal and external kerb corners are available, as are sections which rise and fall to cater with the changing height of the garden or to create disabled access in accordance with current guidelines. Edging for other forms of driveway and patio surfacing tend to be part of the design rather than being purely functional and quite often a block paving driveway or patio will have a different coloured block border. This also applies to pattern imprinted concrete which normally has a block effect design printed into its border, again sometimes in a different colour. Most driveways and patio areas will require some form of drainage, the extent of which is determined by the size of the area, its slope and the type of surface installed. Although both permeable tarmacadam and permeable block paving are available, during heavy periods of rain, water will still run off these surfaces and needs to be dealt with. This is not only for practical purposes to avoid ‘puddling’ or excess water run-off which could freeze in winter time, but also to satisfy planning regulations; SUDS. For small areas which slope towards a garden or border, often a gravel area is sufficient and larger / deeper versions of these which act as a mini soak-away are referred to as rain gardens in America. More substantial and permanent drainage systems will be required for larger areas which slope either to the public highway or back towards the house or garage. These systems will collect rainwater and divert it to underground drainage to be taken away and re-used by your local water company, or to a purpose built soak-away within your garden. A soak-away, which used to be known as a dry well, requires a large hole in the ground to be excavated and filled with stone rubble or the like so that storm water can flow into it by gravity. It will slow down the seepage of water into the water table rather than allowing it to run off quickly onto the pavement or road where it could contribute towards localised flooding. Since SUDS legislation was introduced, homeowners are not permitted to directed surface water from a driveway directly into the household drainage system, nor onto the public highway where it could (with everyone else’s surface water) overwhelm outdated Victorian sewer systems resulting in a risk of local flooding. 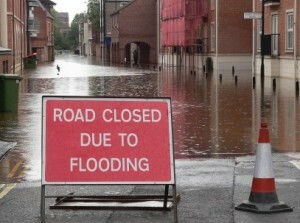 Surface water must be allowed to filter into the ground within the boundary of the property, or be collected. Where a soak away is created to deal with this and comply with the requirements of SUDS regulations, it is acceptable to re-direct any excess surface water which the soak-away cannot cope with, into the drainage system. The rationale behind this is that part of the intent of the SUDS regulations is to cause surface water to drain slowly over time, into the ground. By only piping excess surface water which the soak away cannot deal with, sufficient time will have lapsed to help alleviate the risks associated with directing rainwater immediately to the public drainage system. 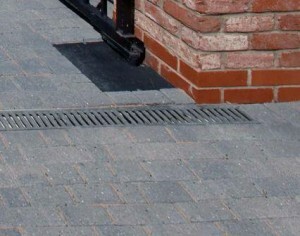 Aco drainage is commonly installed at the entrance to a driveway (to collect rainwater which would otherwise flow onto the public highway) or in front of a garage (to prevent rainwater flowing under the garage door and flooding the garage). Aco drainage consists of a number of interlocking concrete ‘U’ shaped channels with slotted plastic or galvanised steel covers over them. Rainwater flows through the slotted covers, into the concrete channel below ground and away to underground drainage or to a soak-away. On long driveways it is often recommended that aco drainage is installed across the driveway at regular intervals, as just one aco at the end of the driveway may be unable to cope with the volume of water flowing towards it. When a pattern imprinted concrete drive is installed, the installation of several lines of aco drainage offer a secondary purpose by dividing up the large area of concrete into smaller sections or slabs. This helps to deal with potential random cracking of the concrete surface which is more likely on large areas of concrete surfacing. The growth in car ownership and the lack of on street parking places has resulted in an increase in the number of homeowners wishing to convert their front gardens into parking areas. Converting a soft landscape such as a lawn into hard standing has obvious implications with regard to planning permission (see above), but there is another issue to consider – that of access. Some pavements can be 150 mm or so higher than the adjoining road and driving over them can cause damage to the underside of your car. 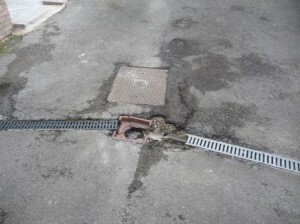 It could also cause potential damage to pipework underneath the pavement which was never intended to take the weight of a vehicle. Dropping the kerb down to the level of the road involves lowering the kerbs, (with rising kerbs either side) creating a slope from the road surface to the entrance of your driveway and strengthening the pavement surface in between the two. Permission needs to be sought from your local authority to drop a kerb down to road level as it is their responsibility for maintaining most public highways. Some local authorities and councils have their own staff to carry out the work involved in dropping kerbs and are happy to quote you for the work. As part of the application to drop a kerb, you will need to submit drawings of your proposals and pay a fee, but there is no guarantee that planning permission will be granted. If approval is granted, the local authority will provide full specifications of the work to be carried out and may make a visit to inspect whilst the work is being carried out. Dropping a kerb without permission can result in a fine and the cost of returning the pavement and kerbs to the original state. You could also be held responsible for any damage to pipework and services buried under the pavement.